Harvesting insights (4): Making knowledge travel? | Agile KM for me… and you? Time to revisit a concept that’s key in the recent past of ILRI’s and some other CGIAR knowledge work architecture: making knowledge travel. This concept and approach was, among others, central to the Agricultural and rural knowledge Share Fair organised in Addis Ababa in October 2010. This post written by organiser Nadia Manning right after the event summarises some perceptions about ‘making knowledge travel’ from the Fair. What are we talking about and what are the implications of this concept and its meaning? The idea, in the ILRI/CGIAR practice is quite simple: we are overwhelmed with knowledge and information but we also struggle to unlock useful information (and perhaps they would say knowledge) that remains stuck in silos, databases and private spheres. We should promote ways for that information and knowledge to travel further than those static ranches of safeguarded knowledge treasury. We have to make it travel. An important distinction: let’s agree that for this post by ‘information’ we mean concrete/tangible data put together to be consumed readily (i.e. articles, videos etc.) and by ‘knowledge’ we mean peoples’ exchange about information. We have to make information available, accessible and applicable (the Triple-A framework that the above-mentioned post highlighted) which means information should be developed (available), easy to find in full access (accessible) and developed in a way that makes its use possible (applicable). More on this in the implications. It means we should make use of the information long tail to counter the tyranny of ‘pushing yesterday news out’ – some of that older information remains useful long after its first publication. Finding, encouraging, stimulating, developing spaces for connection between information sources and consumers – whether these be multi-stakeholder processes or specialised channels between certain groups of people. What it implies for our organisations and for ourselves? There are lots of lessons to take upstream if we want to make knowledge travel downstream. Turn our work into information – not only the results but also the work processes – documenting the process to tease out important insights. Share that information in various ways, using websites, social media (which have a very strong potential to redistribute that information more widely by the virtue of trust-based network affinities) and other media that are fit for that purpose. Save that information in available, open access places where anyone can find it later – ideally properly (meta)tagged to help others and search engines assess the relevance of that information against a given query. Develop that information in open standards so that it can more easily be (re-)used and adapted by others. Format/version/package that information possibly in different formats and levels of language and technicity for different audiences. Encourage contacts with wider networks, beyond our familiar networks, which can be amplified by social networks (following people that are at the edge or our own networks i.e. the people that are followed by the people we follow). Organise effective events and conversations to weave information and knowledge in trust-based networks that are reinforced by face-to-face contact. Indeed use multi-stakeholder processes – where applicable due to the complexity of the agenda at stake – to encourage knowledge sharing and further connect distant/remote parts of a given social network. As you might have picked up, this involves once again a sound personal knowledge management practice of ‘working out loud’ but also other things. And then again, ‘making knowledge travel’ does not entirely unveil what is at stake. What this approach perhaps doesn’t emphasise enough? Perhaps the ‘knowledge’ aspect itself was not sufficiently emphasised – as the overall approach of making knowledge travel actually seems to relate mainly to information. What it thus doesn’t say enough is that not only should we make sure our information is available, accessible, applicable (and actually applied!) but that we should also organise processes – using specific tools, since despite their over-reliance tools are not so bad after all – to ensure that people connect and share knowledge to make it travel further. Consequently, the most important aspect is to connect knowledge (thus people) rather than information because what matters is not information, not even knowledge, but learning from both and acting upon it. Learning out loud is instrumental, in this respect, to go one step further than making knowledge travel perhaps emphasises. Maybe we should talk about making learners travel together, as a more accurate and more useful paradigm. Using other face-to-face methods of social learning would come in handy in this respect too: farmer field days, exchange visits, study tours, secondments, knowledge fairs, coaching and on-the-job training, job rotation, peer assists, action research and the likes are all ways to do this – and the more consistent, repeated, long-term these processes are, the more likely they are to build trust and to become useful for social learning and more effective action. Finally, the very idea of making knowledge travel could be fallacious, if we believe a great few influential KM thinkers on the basis of this post by Harold Jarche and its comments. I tend to agree with them. I think we can share knowledge but we can’t transfer it (more on this in this post), so I doubt we can make knowledge travel, but information we certainly can. And stimulating more and more diverse ways to share knowledge should be amplified as part of this approach too. At any rate, making knowledge travel is more helpful than making information rot in the cavern and knowledge stay quiet in our heads. So, thank you Nadia, Peter and others for inviting us to make knowledge travel about making knowledge travel… the journey is very exciting already! This entry was posted in Communication, Harvesting insights and tagged CGIAR, ILRI, knowledge, knowledge travel, social media by Ewen Le Borgne. Bookmark the permalink. Nice idea to have the passports and visas – and opening the borders to knowledge sharing. What I was reacting on was the very idea that knowledge can travel. It gives the idea of a commodity, which is dangerous/erroneous. But I know your philosophy is all about opening conversations so it’s quite interesting to see the different directions this approach is taking with e.g. CIARD and the many others (‘much more’) which you alluded to. The original knowledge ‘traveling’ notion I worked with tried to draw on a ‘passport and visa’ metaphor – arguing that we have to intentionally do things and do them differently to make knowledge and information ‘travel’. It does not go on its own. Essentially, like people, knowledge needs to be able to cross borders, and we can help this happen by giving the knowledge, and the processes used to create and share it, characteristics that will reduce barriers and get it through checkpoints …. See http://iaald.blogspot.com/2008/01/bringing-knowledge-into-public-domain.html (and http://www.slideshare.net/iaald/passports-to-open-information-and-knowledge-exchange-233244) where I briefly write up a 2007 session where I talked of innovation systems approaches (people), public goods getting Triple A (content), and web 2 (tools) as all parts of a wider movement in which knowledge (and information and data an ideas…) all get to migrate and travel (or have less barriers to do so). I don’t see any particular knowledge ‘transfer’ or push inferred in this approach (though it can be sold a such); we just try and open up processes, content, tools, and thinking/mindsets so ‘knowledge’ has a greater chance of getting taken up … How this happens is myriad and largely dependent on the person(s) doing the ‘uptaking.’ It should be much easier as the knowledge is in forms and from processes that provide for borderless travel. 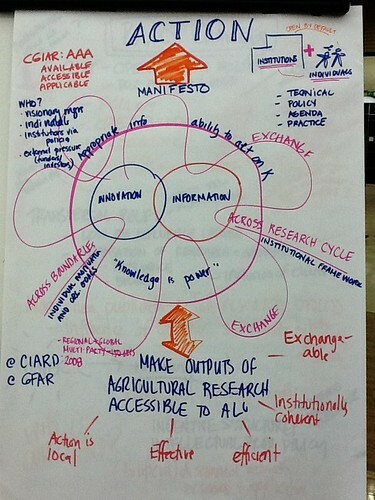 Coming out of all this – and much more – is CIARD (http://www.ciard.net/), which we originally though of as a kind of agricultural knowledge commons ‘movement’ but which is now more narrowly focused to emphasize information, accessibility, and dissemination…..